Excavation Site - University Of Chicago | RW Collins Co. 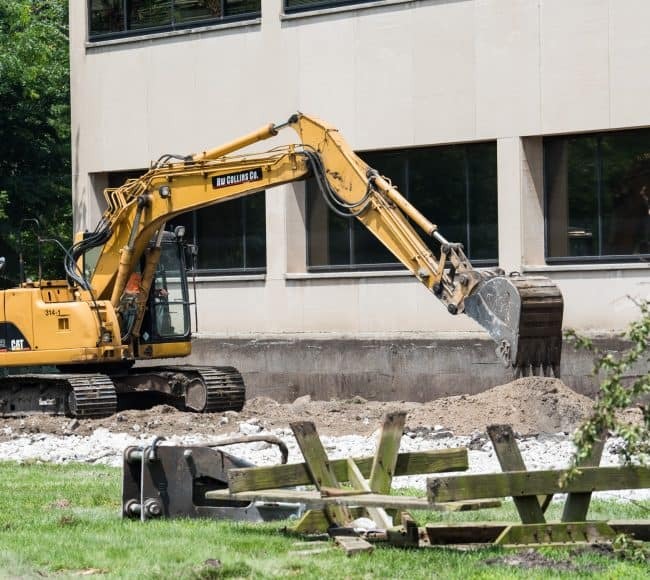 In preparation for the construction of four new student residences at the University of Chicago, RW Collins was contracted by Canino Electric to excavate and remove a retaining wall and footings where an electrical substation will be relocated. As you can see in the pictures below, there was an existing retaining wall filled with black dirt where the new student residences will stand. After our operator broke out the concrete retaining wall and footings using a Caterpillar 314 with a breaker-attachment, we excavated and hauled 400 cubic yards of black dirt. With the old retaining wall removed, the electrical substation can now be relocated so that the new residences, ranging in height from 4-14 stories, can begin construction. Remove existing retaining wall with footings and excavate/dispose of 400 CY of existing black dirt. Remove concrete substation enclosure and affiliated concrete transformer pads. © 2019 RW Collins Co.